This was another trip that we broke into two. 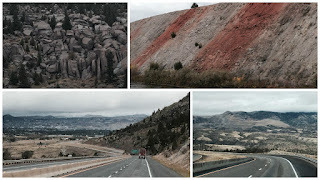 Lolo, MT was the end goal, with a one night stop in Bozeman, MT on September 15th. The drive was nice and uneventful. We did see some pretty scenery and a Muffler Man Cowboy. we were stopping in Bozeman. In one episode, Sheldon moved to Bozeman after his Pasadena apartment was robbed, only to arrive at the bus station in a blizzard and then have his suitcase stolen. Thankfully we did not encounter any thieves on our stop but we did see a large gecko. The Sunrise Campgrounds are well maintained with decent sized lots. They have a nice sitting area in the office, some basic needs for sale in their store, and 100's of DVD's and videos that you can borrow at no cost. There was a really nice dog walking area as well. September 16th we woke to a rain storm and we were so glad that we hooked the car up the night before. 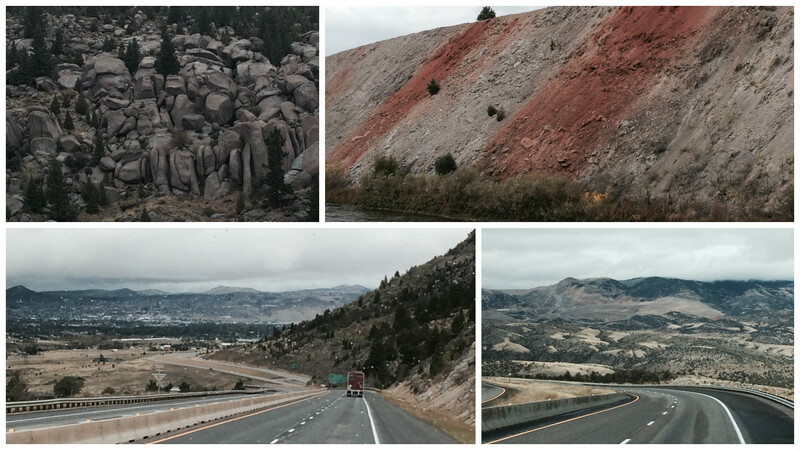 Rained off and on all the way to Lolo, which is just a few miles south of Missoula, MT. The drive was rather hilly, which made it very scenic. The Square Dance Center and Campground was home for a week. No we didn't do any square dancing, nor did we see anyone else swinging their partner. Nice place, very quiet, lots of shade and well maintained, in fact they were a little obsessed with the grass. The Wi-Fi was great and the sites were good sized but laid out strangely. We were parallel to two other trailers which made it hard for them to park their cars. Nancy and Mielikki found a cool old truck and made a new friend on their morning walks. 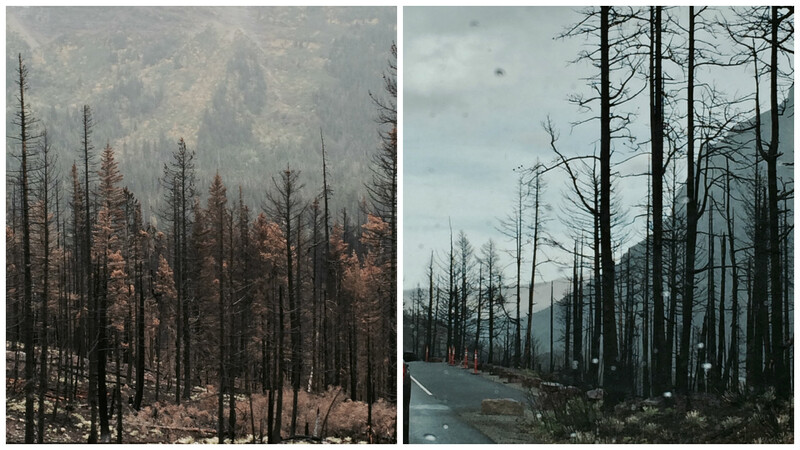 Just down the road from us was the Idaho boarder and the Lolo Forest which was a beautiful drive. 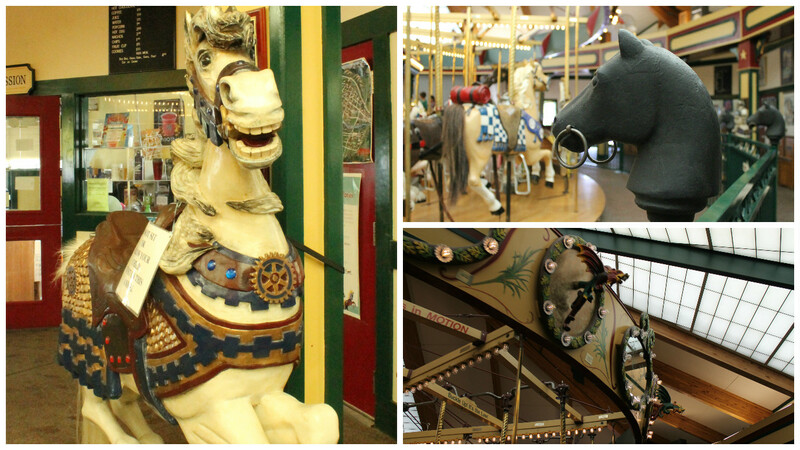 While exploring downtown Missoula we discovered a carousal on their river walk. 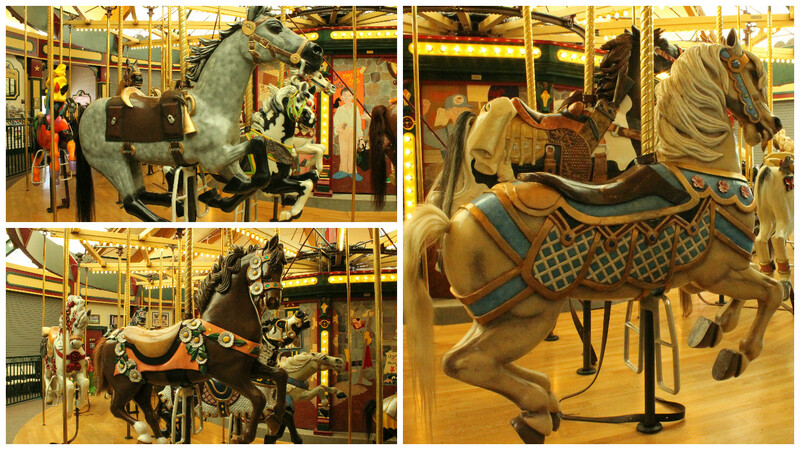 The Carousel for Missoula was the idea of Chuck Kaparich, a Missoula cabinet-maker. He told the City Council in 1991, “If you will give it a home, and promise no one will ever take it apart, I will build a carousel for Missoula.” He had fond childhood memories of the carousel at Columbia Gardens in Butte, Montana, and had already carved four carousel ponies and had purchased an antique frame in thousands of pieces. 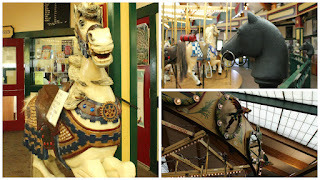 By opening day, May 27, 1995, over 100,000 hours of volunteer time had gone into the construction of 38 permanent ponies; three replacement ponies; two chariots; 14 gargoyles, gargoyle frames and mirror frames; and the largest band organ in continuous use in the United States, all within a jewel box building. There was a constant stream of people waiting to ride it while Nancy was talking pictures. 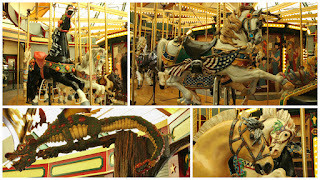 Next door to the carousal is a large play structure that was full of kids. What a great addition to their river walk. The Missoula Art Museum is on the small side but still very nice. One section was closed as they were hanging a new exhibit and we got to get a little bit of a sneak peak. They did have an interesting exhibit of photos from one room schools that are still in operation today. There are about 200 across the country and Montana has 75. We were so excited to hook up with Gordon and Joyce Cummings. Gordie and Nancy grew up together and have known each other since they were toddlers. That's a long time!! We drove up to Ronan to meet them and spotted a rainbow on the way. We went into Polson for dinner at the MacKenzie River Pizza Co. Great food and great friends. The town of Ronan was very festive as all the businesses were decorated for their fall festival. 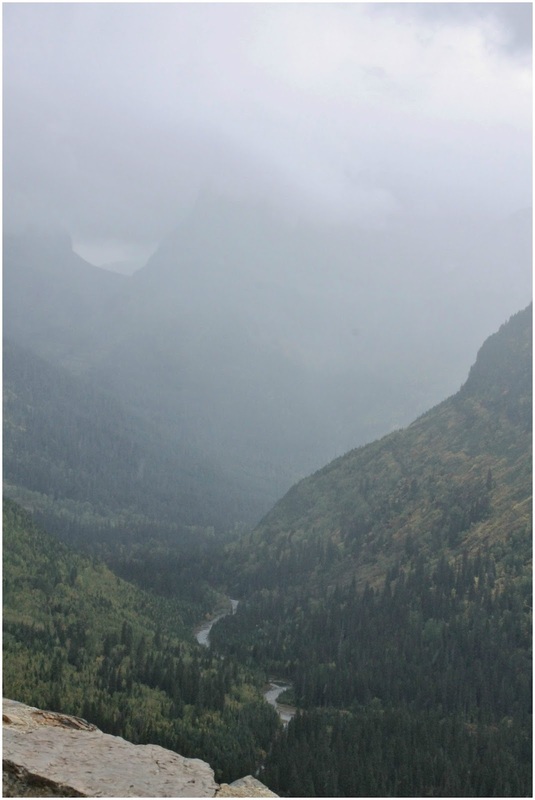 Besides Gordie and Joyce, the Glacier National Park is what brought us to this area. People have been telling us that it is their favorite place on Earth and now that we have been there we can see why. On the way there we stopped to visit another friend. Nancy Waggoner and her husband Ken are building a beautiful cabin just outside of Glacier National Park. They have the most amazing views. Nancy and Nancy sold PartyLite at the same time for a number of years. It has been a while since they have seen each other, and Montana was a long way to go to hook up with somebody from Ann Arbor, MI. Mielikki and their dog Koda had a blast playing. On the way to the park we went under an animal bridge, more places need these. 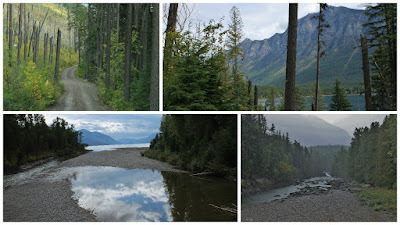 We entered Glacier National Park at the West entrance which takes you along side McDonald Lake. We took a side road around one end of the lake. It got very narrow and a little rough in spots, but the views were worth it. Just past the lake you come to McDonald Falls. You can see Mt. Vaught at 8,850 feet. 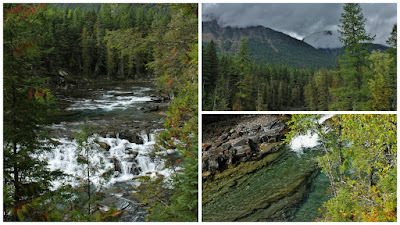 The Sacred Dance Cascades were beautiful. They are a great example of how powerful water can be. Over the years the water has eroded the rocks in a swirling pattern. The water is so crystal clear it is deceiving as to how deep it really is. We also spotted a grizzly bear getting his afternoon refreshment. As we drove we couldn't stop oohing and awing. Every couple of minutes one of us was pointing and saying "Look at that". St. Mary's entrance on the east side of the park was our goal. In order to get there you have to cross the mountain. The road takes you to the "loop" which is the top of the ridge. 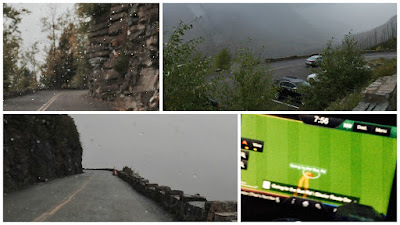 We experienced every type of weather driving up to the loop and then back down the other side. Sun, rain, heavy fog, sleet, and we saw lots of snow in the mountains. We saw waterfalls, beautiful stone, and even a bride and groom. It was about 48 degrees when we passed the bride and groom. Wind whipping around and rain coming down. Beautiful spot for a photo but they had to be freezing. When the shot was done the bride hiked up her dress and ran up the hill side. This reminded us of Katrina and Steve's wedding day and the beautiful, but cold, snow pictures they got. Barring Falls - we think! We drove through a section that was part of the recent fires. After arriving at the St. Mary's entrance we decided to go to the Many Glaciers, just a bit north. We are so very glad we did. The views of the mountains were astonishing. We stopped at the Many Glacier Hotel on Swiftcurrent Lake. It reminded us the Grove Park Inn, in Asheville, NC. Beautiful and huge lobby, three stories high with a large stone fireplace, and comfy sitting areas. A place you want to curl up with your favorite beverage and get lost in the views. This was just the beginning of the sun providing us with beautiful scenes. On our way back out of the park we found a small side road that led us down to the rocky beach of Lake Sherburne. Nancy wandered the beach looking for the perfect rock and when she turned around the sight was so beautiful she almost cried. The sun was peaking through openings in the dark clouds. This is where we decided to have our picnic dinner, there isn't a 5 star restaurant any where in the world that could give you such a wonderful view. Nancy did find the perfect rock. Our ride back through the park to the west entrance was quite the trip. Once again we hit rain and fog, but this time is was getting dark. Nancy is pretty sure she left finger marks in the door handle, she was so terrified a few times it brought her to tears. It did give us an opportunity to see everything from a different view point. Nancy opened her eyes a few times and got some pictures of the snow and one particularly bad curve. 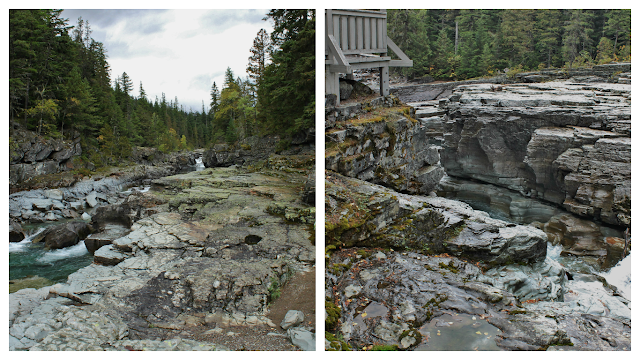 One day was not enough time to explore the whole park, but what we did see makes us want to see more. What an amazingly beautiful place. 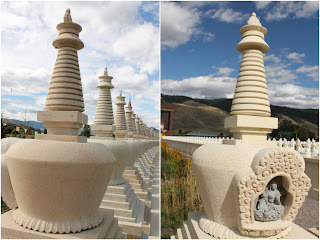 Arlee, MT of all places, is the home of the Garden of 1000 Buddhas. Actually, we found out that there are really 1008. The garden is a project of the Ewam School of Tibetan Buddhism. 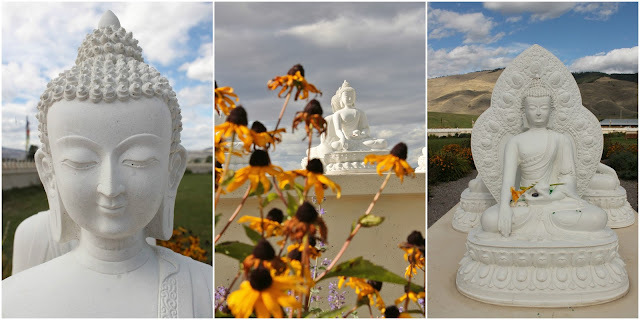 It was created as an inspiring place to cultivate kindness, equanimity and altruistic qualities, and to help give rise to compassion for the benefit of all beings who share the world. Everyone of every faith, culture and race; every walk of life, is welcome here. 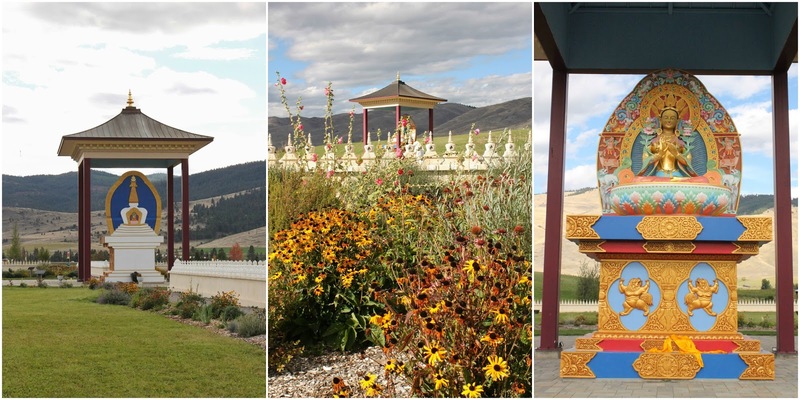 The garden is in the shape of an 8-spoke Dharma wheel, symbolizing the activation of spiritual awakening. The 1000 handmade concrete statues rest on the spokes of the wheel. Each one contains prayers, mandalas and blessed substances. 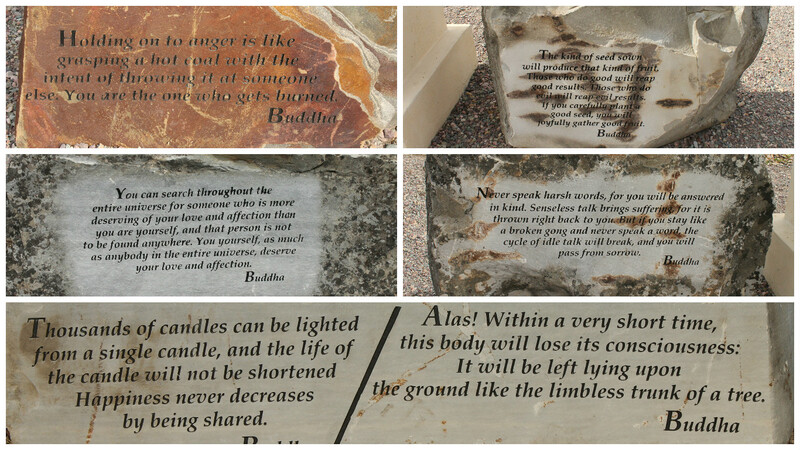 Many people have left stones, crystals, notes and other personal items on the statues. 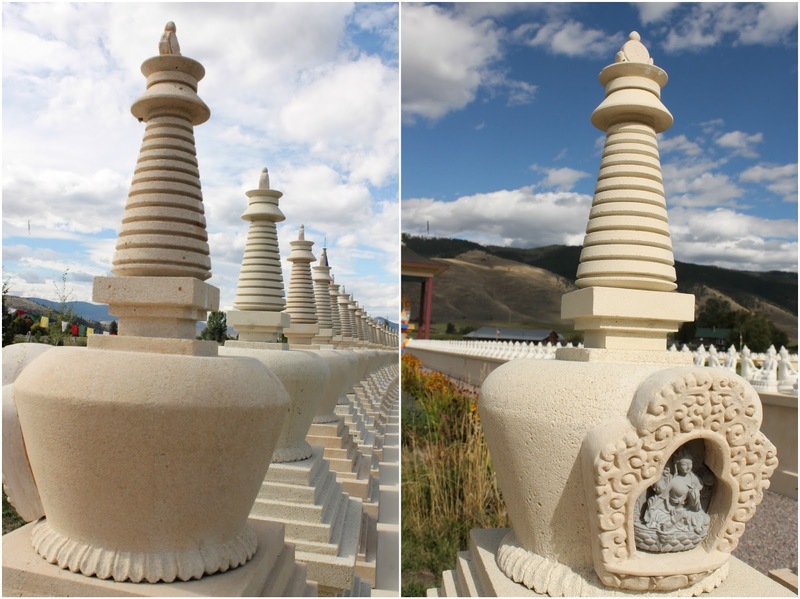 The "Buddhas Of The Three Times" statues are hand carved from volcanic stone and are placed at the cardinal points. The centerpiece is Yum Chenmo, which means the "Great Mother". She symbolizes the source of all phenomena. 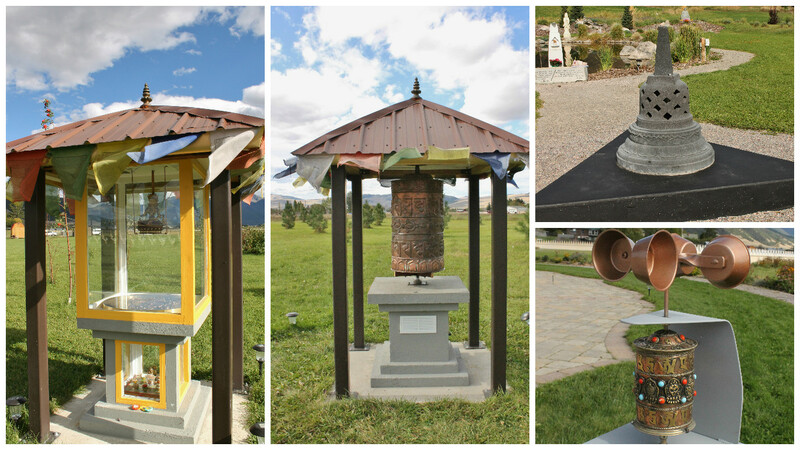 The figure was created in place from hand sculpted cement and is filled with prayers and sacred items. The outside wall of the wheel is lined with 1000 Stupas. The Stupas represent the enlightened mind itself. Symbology reveals the stupa as the mandala of the entire universe. Inside the gau of each one is the image of the female deity Tara. We found a wasp home in one of them. At the back of the circle is a small pond with the statue of Quan Yin, the Bodhisattva of infinite compassion. There were flower gardens planted all around the grounds. The garden itself was so peaceful and the setting was perfect. 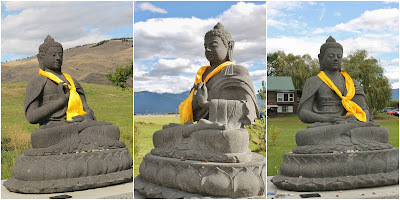 An interesting point that a lot of people may not realize is that Buddhists do not worship statues, to dispel the poison of pride, practitioners bow in deep respect to the enlightened qualities of loving kindness, compassion, equanimity and primordial wisdom. 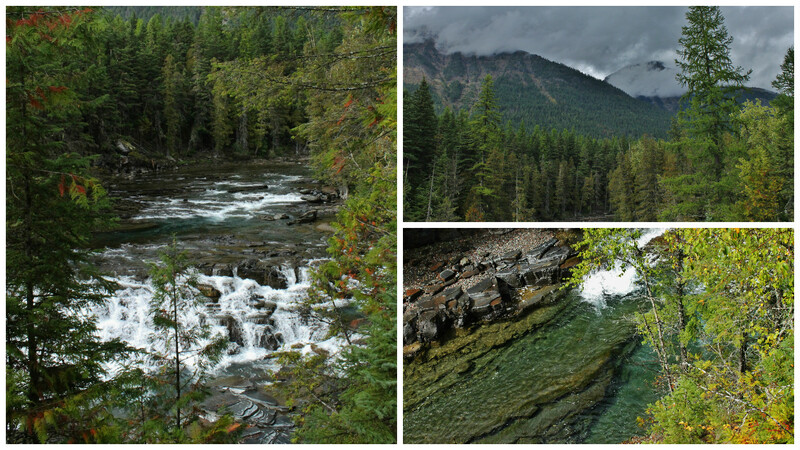 Montana offered so much, from the stunning to the quirky. We loved reconnecting with old friends and made a few new ones. Wondering what treasures Idaho has for us. ~ Making memories is what this trip is all about. Remembering them all is another story. After a while it starts to blur together. There are a number of ways to preserve those memories. 1 - A blog - perfect for looking back on where you have been and what you have seen, and an easy way to share your travels with others. We also keep a written journal that has all the details, big and small recorded from each day. 2 - Pictures are another, and we have tons of them. Each stop has its own folder with the name of the city we are staying in and the dates we stayed there. In that folder is a file for each days outing, each picture is dated and labeled as to what it is. A time consuming project but so worth the effort. If done every couple of days its an easier process. 3 - Pictures turned into photo albums or photo books - we are working on a Shutterfly book of our first 6 months. 4 - Mementos from various places. Tickets to special places. Maps, brochures or postcards. We have a growing collection of rocks and small pieces of driftwood we have collected along the way. The place and date are written on each one with a permanent marker.